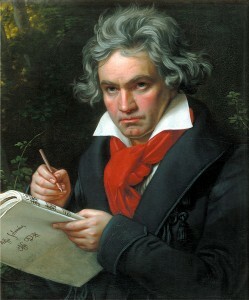 Joseph Karl Stieler: Beethoven mit der Missa solemnis Ölgemälde, 1819. Image courtesy of Wikimedia Commons. Atlanta residents have the all-too-rare opportunity to catch a pair of live performances of Beethoven’s Missa Solemnis (Op. 123) with the Atlanta Symphony Orchestra and Chorus on January 20 and 22 (Thursday and Saturday). Donald Runnicles is conducting with with the principle soloists Christine Brewer (Soprano), Karen Cargill (Mezzo-Soprano), Thomas Cooley (Tenor) and Eric Owens (Bass-Baritone). If you have not seen this work live, it can be an overwhelming experience. Beethoven considered this work to be his greatest, and I’m inclined to agree. The choral writing is astounding, especially the two lengthy, virtuosic fugues that cap the Gloria and the Credo. While the Mass as a whole is monumental in scope, it also has passages of sublime lyricism (the entire Benedictus) and ethereal beauty (the Credo’s Et Incarnatus Est). The latter passage, which is in the Lydian mode, also illustrates how Beethoven closely studied Renaissance and Baroque music while composing this radically innovative work. Because the Mass is so long and complex, it benefits greatly from multiple listenings. To my mind, the three most successful recent recordings are by John Eliot Gardiner, Philippe Herreweghe and James Levine. Gardiner’s period instrument recording with the English Baroque Soloists and the Monteverdi Choir is often regarded as the best in the catalog. I like the transparency of texture that Gardiner brings with his relatively smaller orchestral and choral forces. The soloists are uniformly excellent, and I think his brisk tempi are very much on the mark. Herreweghe takes a similar approach with the Ghent Collegium Vocale and the Orchestre des Champs-Élysées, but benefits from the deep spiritual conviction that the conductor and his ensemble bring to the work. While in general I favor the faster tempi that Gardiner and Herreweghe take, I do think there’s a limit to how far this approach can go; David Zinman’s recording with the Zurich Tonalle Orchestra features dazzling performances, but at times it is simply too rushed for the music to have the spiritual impact that Beethoven intended. James Levine’s live recording with the Vienna Philharmonic, Leipziger Rundfunkchor and Swedish Radio Chorus is my personal favorite of the numerous recordings with a conventionally-sized (large) orchestra and chorus. The soloists (Cheryl Studer, Jessye Norman, Placido Domingo and Kurt Moll) are decidedly operatic, but I think they blend well and one could argue that such an operatic style is legitimate here. The chorus is also extremely impressive, even thrilling in places. One aspect I like about this recording in particular is that despite the large forces, it maintains an effective balance between the orchestra, chorus, soloists and organ–something which is apparently difficult to pull off. You can hear a number of details which often get buried elsewhere. Levine’s tempi are broader than Gardiner’s and Herreweghe’s but not unduly so, and he brings considerable vitality to the aforementioned fugues. Whichever recordings you choose, this is one work that needs to be heard live for its full impact.